Friends, your encouragement has me thinking we can change Washington and help America meet the challenges of today and tomorrow. We're entering a new phase of this process and we aren't going to do things the same old way. Now. I need your support to keep us moving forward. 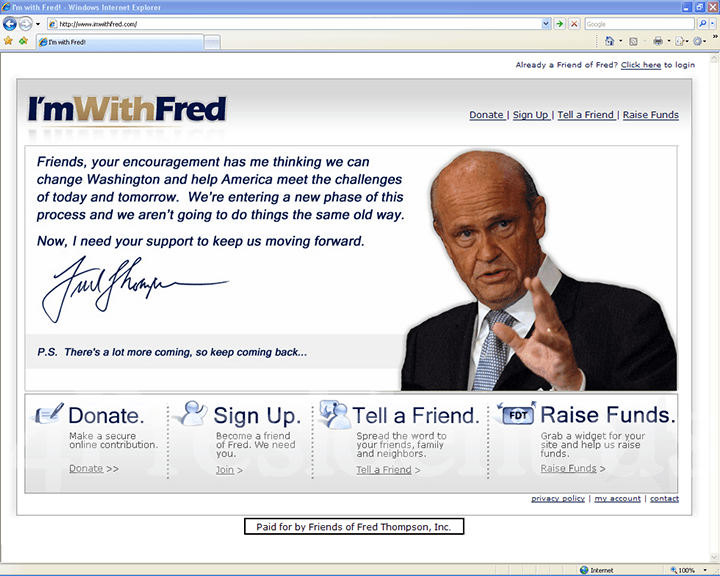 I’m one of tens of thousands of Americans encouraging former Sen. Fred Thompson to run for President. I’d like you to join with me and Fred and all our friends in changing the political landscape in 2008. Senator Thompson recently announced that he was taking some preliminary steps toward entering the Presidential race, and to show my support I signed on as a "Friend of Fred Thompson." I’m writing to ask you to consider doing the same. Senator Thompson has been a prosecutor, a Senator, and yes, he’s had a couple of movie roles. More importantly, he’s exactly what we need right now – a consistent conservative who can unite our nation and help lead us in fixing our problems, not exploiting them for political purposes. "No matter how much lipstick Washington tries to slap onto this legislative pig, it’s not going to win any beauty contests. … We should scrap this "comprehensive" immigration bill until the government can show the American people that we have secured the borders -- or at least made great headway." "They only want to target the rich. They’re off target again, just like they were with the alternative minimum tax. Remember, that was supposed to just target the rich. A word of advice to anyone in the middle class – don’t stand anywhere near that target." "We're going to have to be more focused, we're going to have be smarter and we're going to have to be more determined and we're going to have to be more together as a nation than we've ever been before." Fred has said he wants to do things differently. He wants to focus on returning to our founding principles of self-governance, free markets and the rule of law. Those are ideas we’re all invested in – focused on building a stronger, more competitive and innovative America that remains a beacon for the world today … and for the next generation. I’ve done my part to encourage Fred to run, and I want you to join me. Visit ImWithFred.com to sign up. If we can get enough people to sign on with us and support us, we can change America … together. Thanks for your interest. I hope you’ll join me and become a Friend of Fred.